These five bright boards were painted onto marine ply and varnished with heavy duty glaze to make them weather resistant. 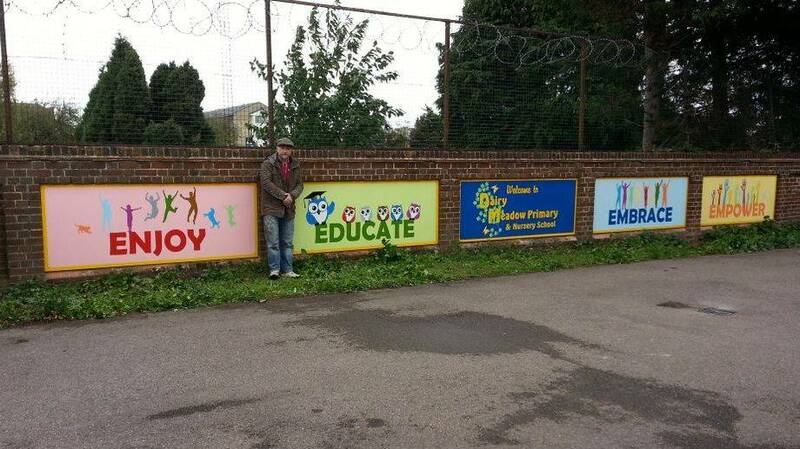 They feature the four 'E' words that Dairy Meadow School use for their motto - Enjoy, Educate, Embrace and Empower. The middle board has the school logo and a welcome message. These boards were fixed onto a wall near the school entrance, so they will be seen each morning and evening by pupils and parents. They brighten the area and make use of an otherwise redundant space. These boards took us seven days to complete - this included preparation time, painting, varnishing and travel to the site to attach to the walls.